Home » Blogs » Outsmarting Social Media » QR Codes Are Every Where But Do They Work? QR codes (or Quick Response codes), those little black and white squares that look like crosswords, are appearing everywhere: in magazine ads, on product labels, on bus stops, you name it. If you scan them using your smart phone you are taken to a related webpage (without having to type in the URL). I blogged about them a year or so ago and have watched with interest as they proliferate. Marketers love them but are the really resonating with their intended audience? I decided to find out. According to a recent Comscore report, 14 million Americans scanned a QR code using their mobile device in the month of June. So people are using them but it is interesting to note that the main demographics were males aged 18-34 in the high income bracket – so be cautious in using these if your target markets differs. Another recent report in this CNN article in the US surveyed students and only two out of 10 even knew what a QR code is. QR codes are a great marketing tool in theory but using them is far from a seamless experience. In the last week I scanned several QR codes and have been frustrated by the lack of compatibility between the QR scanner on my phone resulting in the appearance of error messages rather than taking me to the enticing, targeted websites I expected to see. Of the 10 or so codes that I scanned only one worked seamlessly to launch the intended web site – the rest I gave up waiting on and couldn’t be bothered to download another barcode app that would work. 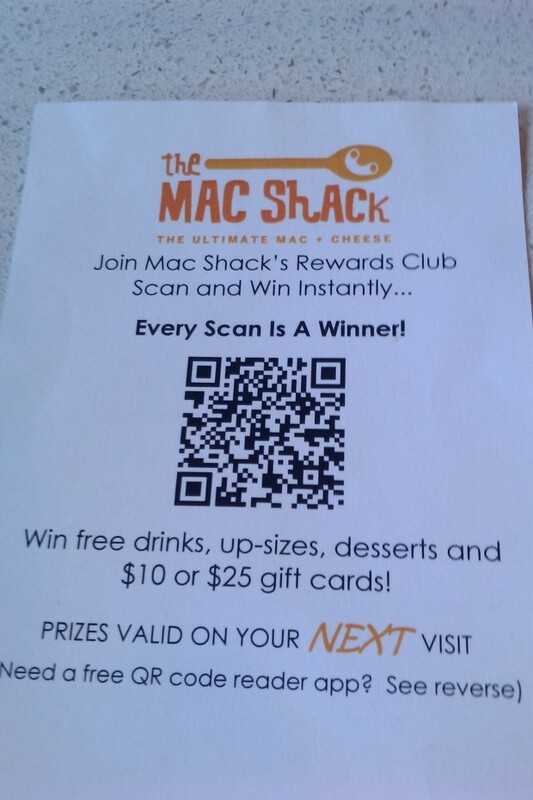 Here’s an example: I ate out recently and saw this QR code (see photo) being used in at the MAC Shack in Kerrisdale (Vancouver, BC) as part of a promotion. Above the code, it says "Every Scan is a Winner!" and under the code, it says "Win free drinks, up-sizes, desserts and $10 or $25 gift cards!" So in my quest for QR knowledge, I decided to scan it to find out what my prize would be. Sadly I never found out because the app failed to launch properly, I ended up frustrated, annoyed and hungry for more. It didn’t put me off my mac cheese thankfully (nothing could) but it did give me some food for thought. In this case, I only wasted a few minutes tinkering around trying to get it to work but for the marketer who devised this campaign, their time in putting this together was rendered useless (I’m assuming that I wasn’t the only one that tried to scan it in vain). There are far better ways to build your audience (tried and tested ways) that work. Not only that but from a marketer’s perspective when your audience is expecting something and they don’t get it (or it fails to work), what does that say about your organization. It’s all about the optics. If you can’t get it right then why bother wasting your audience’s time. Sources in the telecom industry tell me that the next generation of phones will be able to scan these automatically so the problem of unstandardized apps may go away but in the meantime, marketers should give close consideration to their audience and to making sure that their QR codes work seamlessly with as many of the readers as possible. Otherwise, it might be better to consider more tried and tested methods to grow your community. Don’t get me wrong, the potential for QR Codes is huge and one day they will be a marketing tool that you can’t ignore but for now not so much. Good article and although I only work with 2d codes part time now I was at the forefront of their introduction and initial promotion over 7 years ago, so can speak with absolute knowledge of both their capability and now having seen them approach critical mass of adoption. What’s the most important thing to know as they now get adopted by more and more businesses, is they can actually do a whole lot more than simply link you to a url – a lot more. But, it’s not just about having a code reader (code scanner effectively ) on your phone, it’s about what the technology behind that scanner can achieve – and this is where very few major players in the industry can stake a claim. Most can only do a limited number of things, so when you really want to know the who, how and what look at the guys who lead the field – 3GVision and yes, UpCode too. Why do they differ – well, in my personal opinion 3GVision led the way and took the product form Japan to the worldwide stage. UpCode, though not the best marketeers, focused on product development and would surprise you with what’s possible. Happy to explain more but hope this gives a feel for what’s to come. Oh, and by the way, the reason you had problems is because of what I very simply explained above. You need the technology behind your phone to make it work best – 3GVision and UpCode’s app’s are 2 f the best, but phones are being redesigned and updated every day, and everywhere around the world – so it’s always going to be a game of catch up for developers. With the best apps, you can read a code smaller the size of a little finger nail – and it’s going to get better – imagine that and the potential for data protection, passports, products and tracking etc. watch that space! Thanks for the industry insight and for the tips on the best technology to use.